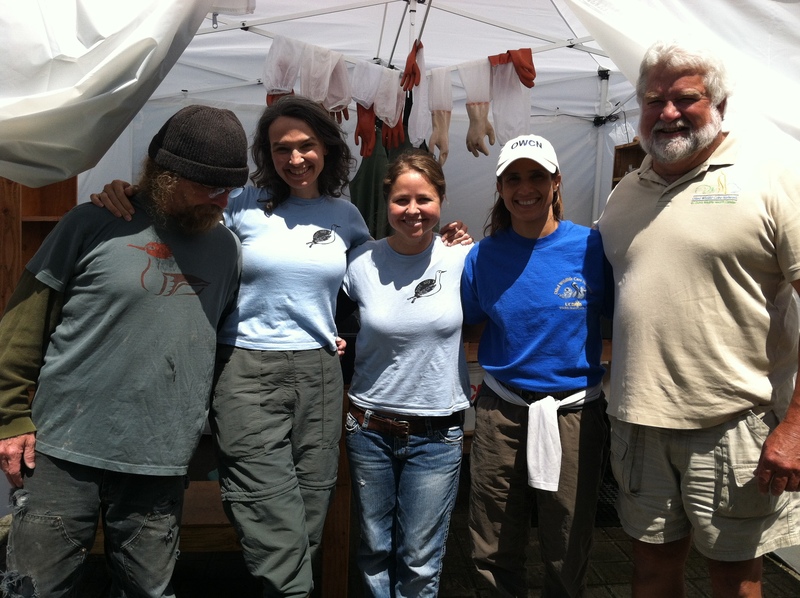 The fish oil pelican event in northern California continues. 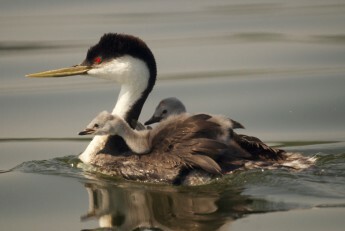 Tim and I just returned from Arcata last night, where we were continuing to help our friends at Bird Ally X with a variety of tasks related to caring for the pelicans that have been impacted by fish oil discharge from fish-cleaning stations in Crescent City and Shelter Cove over the past month or so. 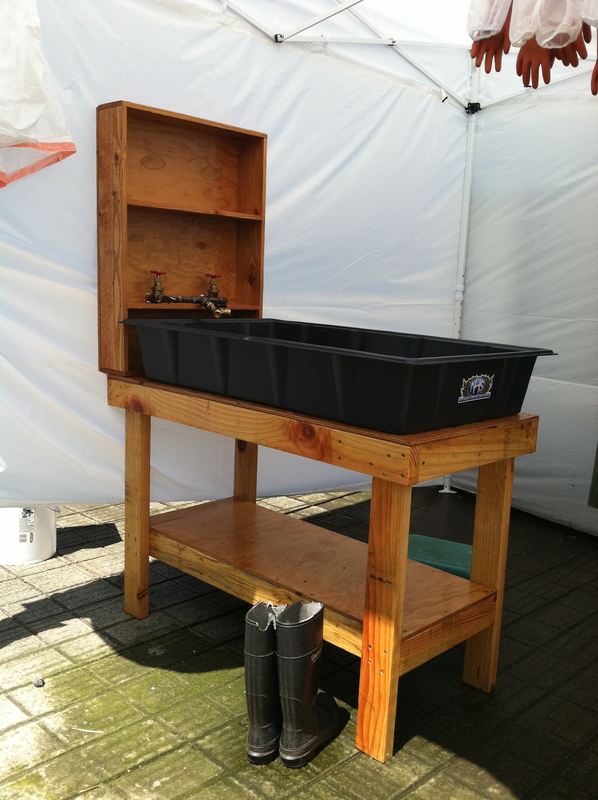 Tim helped build a new washing table (see picture below), and I did a variety of jobs, including feeding, washing, and caring for the pelicans. It was a very positive experience for me and I learned so much during the past few days. The general feeling that one gets being at the facility is how similar this is to a real oil spill. Time is of the essence – to capture the birds affected as quickly as possible, because the quicker you capture them, usually the better shape they are in; to set up the facilities and personnel needed to care for such a large number of animals; and lastly, to continue to operate, day after day, on little sleep (and usually lots of sugar and caffeine) without burning out. 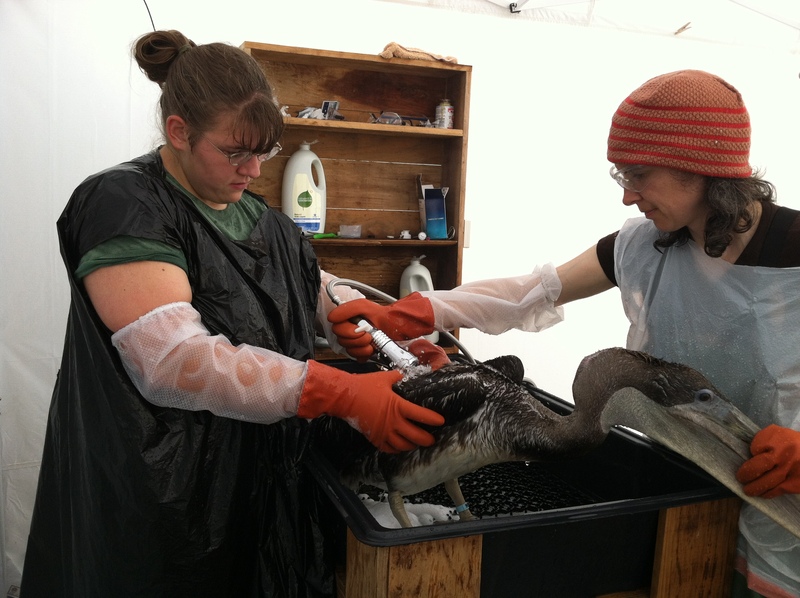 Lucinda and Laura washing a pelican – a long process that takes an hour or more. Animal care is the focus of a response of this nature, but without the humans caring for the animals, the whole operation would fail. And it is the human aspect, which is at its finest, in times of crisis. Without the help and support of people, Bird Ally X would not be able to care for these pelicans. Not only is the financial support essential, but also the support of the countless volunteers that come to help out every day and are willing to go home smelling like fish and pelican vomit. These people put in long hours doing jobs that are not all that glamorous, such as loads of laundry, thawing thousands of fish, and hosing down pelican enclosures. There is also Linda, who shows up with a smiling face every day around 5:00 pm with delicious out-of-this-world home cooked meals for all the staff and volunteers. I very much enjoyed meeting and working with everyone the past few days. Monte, Laura, January, Kyra, and Tim in front of the washing hut. Like pieces of a puzzle, every little bit that everyone does contributes to the overall success of a response, whether it is fish oil or crude oil that coats the birds’ feathers. In the wise words of Aesop, “it is not only fine feathers that make fine birds”. Even though these pelicans are covered in fish oil and for the moment don’t have “fine” feathers, I feel certain that at least most of them will be just “fine”. They are receiving excellent care by an amazing group of people that care for them deeply.